District Health society (National Vector Borne Disease Control Programme and National Health Mission) has observed and celebrated the World Malaria day throughout the district in a befitting manner with the Theme “End Malaria for Good” . At Nongtaw village under PHC Piyong a special awareness campaign with social services was conducted by the NVBDCP staffs and Youth in morning hours. Dr. Nani Rika DMO Namsai attended, appreciated the organizer and youth in particular, gifted a check of Rs. 1500 to Nongtaw youith for conducting Social Service. Also delivered a important speech on malaria and its prevention. Dr. C.M.Thamoung DPO (NVBDCP) elaborated the importance of World malaria Day celebration, highlighted the National framework of Malaria Elimination 2016-2030 with a motto to “End Malaria for good” of this year’s theme, explained about the strategies to be adopted in every household of villages how to prevent and help the Govt. in elimination of malaria from district. He also stressed the Importance of field workers and ASHAs in controlling and containment of Malaria disease in the district. 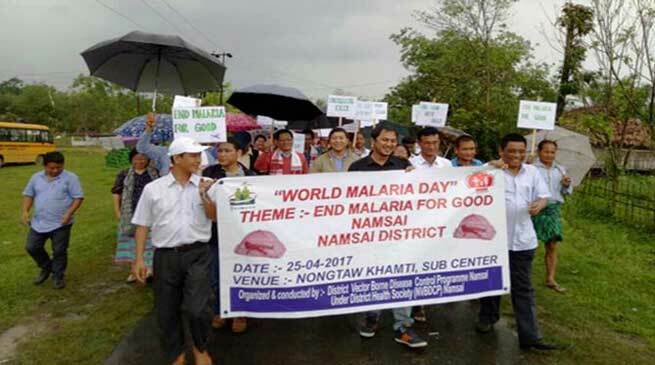 The village head, Chow Thi Longphoi also expressed his grievances and appreciated the step taken by the heath society for conducting World Malaria Day for the first time in Nongtaw village. A mass rally was conducted with play cards and slogans around the village in which DMO, DVBDCPO, Medical Officers, NVBDCP staffs, Nursing institute faculties and students, ASHAs and the villagers took part. Also, World Malaria Day was observed successfully in different CHCs/PHCs/Health Units of the district.